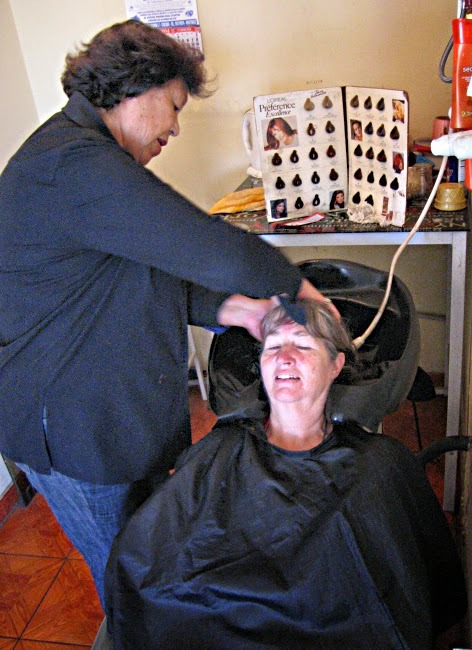 Cathleen's Hands: How to Get your Hair Washed and NOT go to the Movies in Peru! How to Get your Hair Washed and NOT go to the Movies in Peru! Okay, my Spanish is lousy! One thing I do is get similar words mixed up all the time. For example, one day I was knitting in a park. 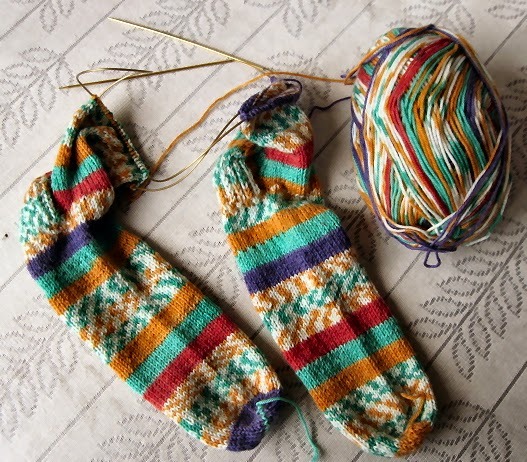 I like to knit both socks at the same time which is unusual—especially here. Spanish lesson for the day: In Spanish socks is calcetínes and hot (plural) is calientes. Say those words out loud. Don’t they sound almost the same? No? Well maybe it is just me. A lady stopped briefly and commented on my knitting and I proudly showed her my socks saying, “Tejo dos calientes al mismo tiempo.” (I knit two hots at the same time.) She walked on, probably chuckling to herself. Yesterday, my tendency for such mix-ups was a bit more embarrassing. Lily and me in her salon last year. ¿A que hora is bueno por tu ir a película? And I made it clear that I was in no hurry—anytime was okay. Do you see what I did? Another Spanish lesson: peluquería is hairdresser and película is film. Luckily, everyone thought is was very funny. I had to repeat peluquería over and over before I could hear the difference and get the pronunciation down. Today, I am still repeating it in my head, especially whenever I pass one of the many salons on the street! I did get my hair washed on Thursday—by my new hairdresser, Yose.